The older I get, the more concerned I am about the little lines and wrinkles that are cropping up on my face. Now, I’m all for aging gracefully. I know that my skin won’t look young forever, but I am determined to slow it down as much as possible. 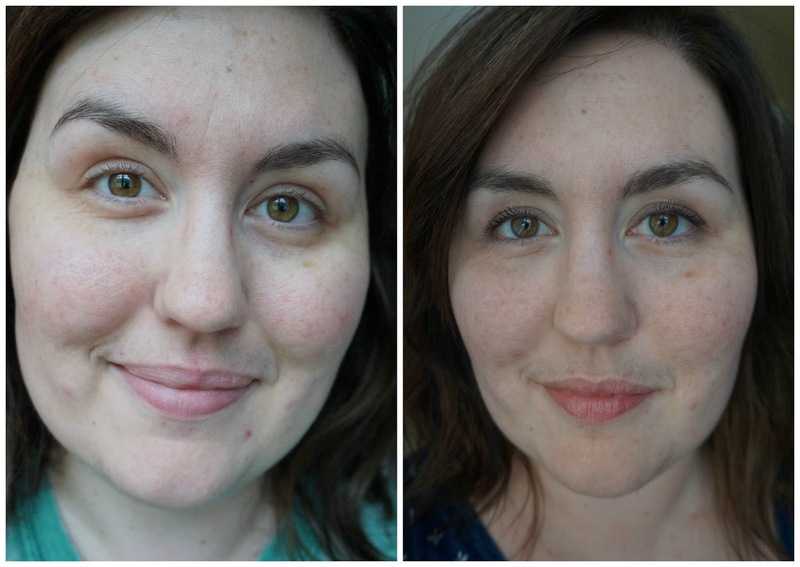 Recently, I was introduced to a new skin care system that involves … face suctioning. I know, I probably had the same look on my face the first time I read it. 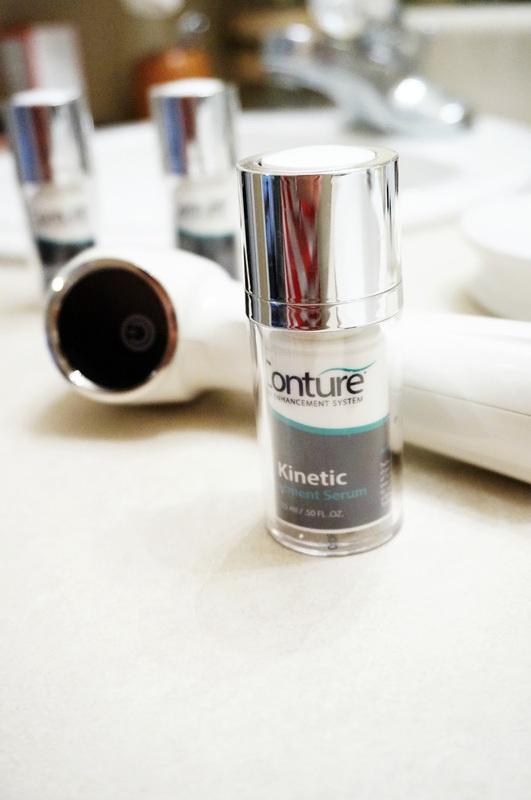 The Conture Kinetic Skin Toning System basically acts like a little vacuum. It sounds very weird, but once you understand how it works, it makes sense. The Conture Kinetic Skin Toning device looks like a mini hair dryer. As you smooth it over your skin, it suctions and releases the skin to stimulate blood flow and to tone your face muscles. Think of it like a work out for your face. 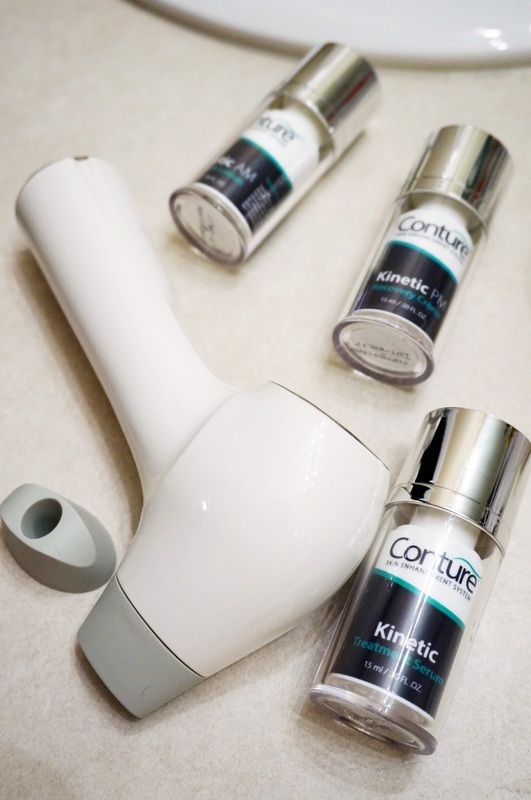 When I started using the Conture Kinetic Skin Toning System, I had a couple of skin concerns. Specifically, I have frown lines between my eye brows and looser skin along my jaw line. I’ve noticed over the past couple years that my skin has become softer, and I would love to tone it up. Since I’ve been using it for a couple weeks, I thought this would be a good time to share my results so far. This is the Conture Kinetic Skin Toning System that was sent to me. The device has two nozzles. One is for larger areas of skin, like your face and neck. The other nozzle is for small areas, like between your eyebrows. I am incredibly happy with my two-week results. I saw results immediately but was skeptical about how long they would last. My skin feels and looks plump and smooth. My frown lines have been less noticeable, which is amazing! One thing that completely surprised me is that my skin looks brighter. I know that other people have had brighter skin as a result of using this but, honestly, since I already use brightening skin care products I thought I wouldn’t see a difference. I honestly believe that the increase blood flow has improved my skin. In two weeks, I will be sharing more ‘after’ pictures. It will be very interesting to see my before/after when I’ve used this for a month! And now, I have a special surprise for my readers! Conture has provided me with a 20% off coupon code. Use RebeccaLately20 when you order the Conture Kinetic Skin Toning Sytem!